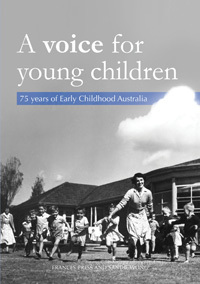 Since its inception 75 years ago, Early Childhood Australia (ECA) has played a pivotal role in the development and support of early childhood education and care services in Australia. Always taking a broad view of its remit, the organisation has a history of engagement in national and international dialogue and advocacy concerning the rights and wellbeing of young children. This brief history traces the development of the organisation from its birth as the Australian Association for Pre-School Child Development (AAPSCD) to its contemporary presence as ECA. This history canvasses the changing context of care and education for young children and traces the way in which early childhood advocates, through ECA and its predecessors, have shaped and responded to the social and political changes affecting children and families. This history tells of an adaptable and resilient organisation, predominantly led by passionate and persistent women, who have had a tangible impact on services and programs for young children.